Refresh your memory and get Back in The Game by participating in a mind boggling challenge Of Diera City Centre Facebook page! 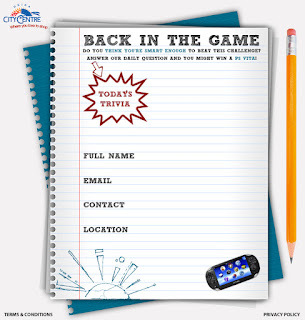 Visit DCC newest contest here and you could be one of 5 lucky winners weekly to win a PlayStation®Vita from Deira City Centre. Questions will change every day during the week and winners will be revealed Thursdays. Solve the riddle for your chance to win. 5 PS vitas will be rewarded each week for 3 consecutive weeks. One PS Vita for only one winner for each day. Winners will be announced on the 2nd, 9th & 16th of September. Share, like and enjoy the contest with Diera City Centre.